In today’s post we’re going to cover the last part of the data management chain: Getting that data out. Hubdoc, Bill.com, Gusto, bank feeds – all deal with data going in, and Xero manages that data once in the system. But how can we get that data out again? Historically, as a 20 year QuickBooks user, I had my go to reports that I’d create for all my clients – being sure to add, “These statements have not been subject to an audit, review, or compilation, and no assurance is provided” as a footer on each statement. True that irritated the client, but they never figured out how to remove them! Xero also offers a similar reporting feature. In some ways, Xero’s reporting feature is cooler and has more bells and whistles than QuickBooks. But, I do respect the simplicity of QuickBooks’ reporting. Maybe this is a generational thing, but I don’t get what today’s folks have against vowels. Anyway, let’s get into the details with Futrli. It’s a cloud based app coming to us from across the pond in the UK. The app, as discussed above, integrates with Xero. Futrli pulls data in real time and presents that data in a fashion that is customized to each client’s unqiue concerns. Before continuing with the details, I can’t emphasize this enough: The cloud, every article you’ve ever read about it, is all about this one item concept: We’re not bookkeepers or tax preparers anymore; we’re high level trusted advisors. The ability to deliver real time, meaningful insights into our clients’ business, as through Futrli, is what the cloud is all about. We love all the apps in our tech stack, but when it comes to Futrli – it can’t be overstated – the entire purpose of the cloud is borne out in apps like Futrli. Before we added Futrli to our firm’s tech stack, I thought that such dedicated reporting apps were something like “icing on a cake”; the native reports in the general ledger system should be enough; even the customizable reports in Xero. After looking into Futrli, I realized that this is not an accurate comparison. Futrli (and any reporting app really) is not some dispensable fluff that’s “nice to have”; it’s a critical piece – THE critical piece of your tech offering. It is a business model. It is a means to provide real world, real time, meaningful insights to our clients that can help them steer their ship. A more accurate comparison would be to this quote from the Russian navigator out of the movie, “The Hunt for Red October” when he boasted, “If I had a stop watch and a map, I could fly through the alps in a plane with no windows.” We are the navigator and Futrli is the stopwatch and the map. Our clients look to us as advisors; not just tax preparers. We can customize the reports on Futrli to give our clients insights into their business that they wouldn’t even know to look for and previously were out of our reach to offer. True, there are other reporting apps out there, and many have been around for a while – but we chose this company because they make it easy – both to use the app and to do business with them. For training, they require accounting partners to go through a series of modules that take about 10 hours to complete – though I was able to work through it in about 8 1/2 hours. They also have a program where for a onetime setup fee, your firm can put its own branding on the reports. That way, your client associates you with the amazing business intel you’re giving them. If you were so inclined, you could build an entire practice solely on advisory services using Futrli as your backbone. Futrli comes with some pre-made templates – or we can customize our own with their in-app report builder. Once the templates are set, they can be easily applied to all the clients you bring on to this platform. In other words, you invest a little time on setup and learning curve in the beginning and then you leverage those efficiencies with each new client. You can set the system to track any list of financial or non-financial items – provided that the data is collected and entered into the system. This makes the setup and integration – and training of staff and clients – critical to making Futrli work. The information that comes out is only as good as the data that goes in. If you have staff or clients that have multiple vendors for say, Wells Fargo Bank NA, WF Bank, Wells Fargo, Bank, they need to stop being so sloppy – yesterday. Part and parcel to adopting this, or really any cloud app is for the firm to adopt a series of naming conventions and then rigidly enforce it. This isn’t just a requirement of the cloud; it’s something we should have been doing all along. Finally, once you get the visuals and graphics set, the KPI’s (Key Performance Indicators) that your client cares about configured, and the reporting templates implemented, then it’s time to print and deliver your professional looking reports – with your logo on them (and that AR-C Section 70 compliant legend) to your client. How often have you put a report out there you put so much time and effort into but felt it was missing something to make it “pop”? Futrli’s reports look professional and eye catching, and thanks to our diligence, their content is useful. These are reports that will actually get read and used. Putting all that work into the various other parts of the cloud ecosystem and neglecting the reporting side is like eating a steamed crab without any Old Bay – why would anyone do that? Check out Futrli and make your practice indispensable! We’d like to hear from you! 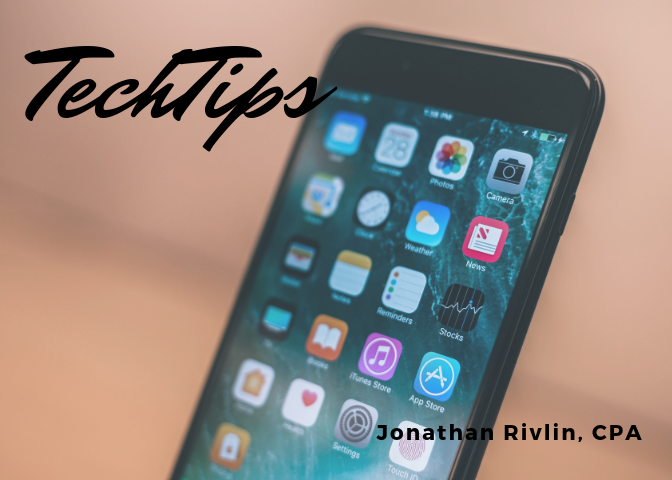 Please submit your own tech tips to us at techtips@msatp.org! We will award a free subscription to The Tax Book to the person who submits the best tip. Thanks, and catch you next time! 0 responses on "#TechTips: Putting Your Best Foot Forward"